The Crimson Tide win four league titles in three separate sports in to cap 2018. The Crimson Tide looked in many ways like their Alabama counterparts in 2018, claiming four league titles in three different sports. 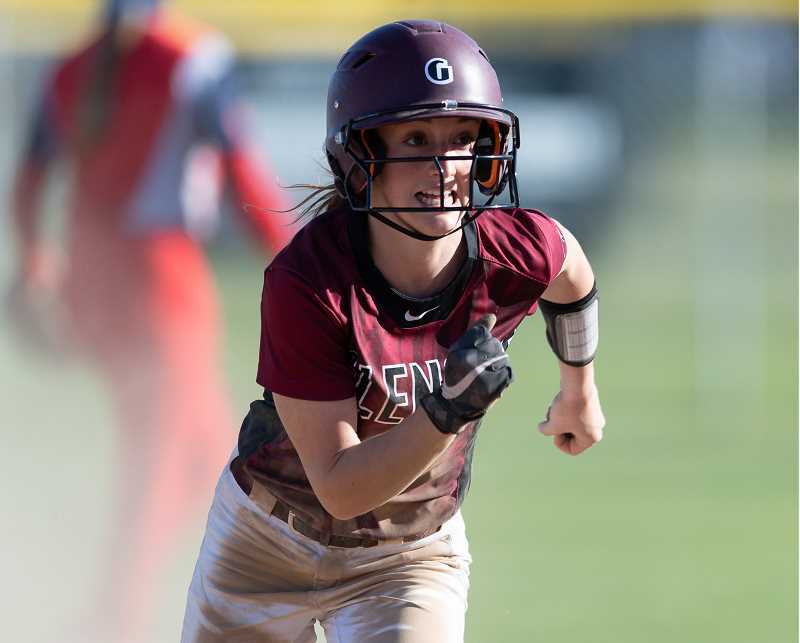 This past fall, Glencoe won Pacific Conference championships in volleyball, along with boys' and girls' soccer, and last spring tabbed a co-softball championship with Jesuit in the Metro League. The volleyball team, playing with just one senior, finished 14-9 overall and 9-3 in league play en route to a Pacific Conference title. The Tide advanced to the playoffs, where they lost in the first round to Clackamas. Despite their early-round exit, head coach Mike Gaffaney was proud of both his team and their season. "We talked in our meeting after the game about how we have an entire season of success to reflect on," said the coach. "We hadn't won our league in 10 years, so that was a huge accomplishment. I hope they remember that, because I thought we had a really exciting season and never gave up, and I love that about this team." Glencoe soccer swept the boys' and girls' league crowns, the boys doing so in unexpected fashion. After starting the year 3-6 in non-league action, the Tide went undefeated in league play, winning a regular-season finale at Forest Grove to clinch the conference with a perfect 6-0 record. Despite their fairy-tale run during the league season, the boys fell in the state playoffs' opening round to Aloha, but they did put five players on the All-League first team and another four on the second team and honorable mention slate. "We started the season tough, but we had to decide whether we were going to fight or give up, and we came together," said the Tide's Neil Zimmerly. "Our goal was to finish in the top three, so to win them all and be standing here as league champs is pretty surreal." The girls' season was equally impressive, even if it fell short of expectations set from last year's trip to the state semifinals. Like the boys, Glencoe's girls went unscathed in Pacific Conference play and appeared poised for another postseason run. But Canby had something else in mind, defeating the Tide 2-1 and ending the run of a senior class that had unprecedented success on the pitch at Glencoe. "These seniors did a lot," said Crimson Tide head coach Josh Richards. "They brought this program from one that had not really accomplished much to one that made the playoffs every year, that made it to the second round twice and the semifinals last year. It's been an incredible run, and one the school will never forget." Glencoe's football team returned to league play after a two-year independent stint, and under first-year coach Ian Reynoso, the Tide comported themselves well despite losing the bulk of their talent from last season's team that finished 7-2. Their record (3-6) may not have borne that out, but Reynoso was pleased with what his team accomplished with such a mammoth task in front of them, and he talked about their progress after a late-season game with McMinnville. "Mac is a phenomenal team, and a strong, powerful team," he said. "They're bigger, stronger and faster than us, and we've run into a lot of that this year, but we fought back. We made mistakes offensively, defensively and coaching-wise, but we grew a lot tonight, and that's awesome and the idea." The boys' basketball team struggled to a 6-18 overall record, while the girls placed fourth in the Pacific Conference and qualified for the playoffs before losing to Grants Pass in the first round. The Tide qualified five wrestlers for the state meet, and point-earners included junior AJ Lucas (126) with four points, sophomore Bryce Archer (145) with four points, sophomore Sutton Yazzolino (152) with five points and David Stadelman (170), who scored seven points. Glencoe's baseball team got off to a hot start, winning four of its first six league contests. The Tide got cold after that and dropped seven of their last nine prior to a play-in loss to McMinnville. Meanwhile, the softball team continued its run of success on the diamond, sharing the Metro League title with Jesuit before dropping a second-round playoff game to Tigard, 3-0. The Tide put five girls on the league's All-Star first team, including Isabel Womack, who was selected as the Pitcher of the Year. In addition, Womack, Morgan DeBord, Ash Bailey and Jensen Becker were all selected All-State. Also in the spring, the Tide's Casey Cameron placed sixth individually at the boys' state golf championships, shooting rounds of 77-77 at Emerald Valley Golf Course in Creswell. Glencoe also had 10 athletes qualify for the state track and field meet, led by Gabriella Justen, who placed fifth in the girl's pole vault.